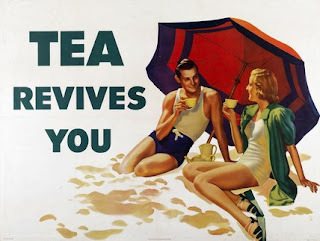 I love all the tea posters, though I must admit to being partial to the first 'Tea Revives You'. I love the bathing costumes and the parasol, very elegant! 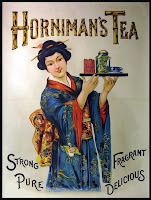 yeah, i used all my favorites in the tea post i did last year. and ! i'm not surprised that one's your favorite! you're much more mid-century than i am. oh, and, you likely don't know about it but yesterday the right-wing nutsos held "tea parties" around the country, to protest.... uh.... well i don't think anybody is sure but it was obviously based on the boston tea party and paying-taxes day (the 15th). I don't really like to comment on politics in other peoples countries, it doesn't seem polite somehow, but I must admit to laughing out loud when some right-wing Americans accused Obama of being a Marxist. I can only assume that they either haven't met too many Marxists recently, or Marxists are a little thin on the ground in the US and so could easily be mis-identified. one person at one of these rallies had a sign with three faces on it: hitler, obama, and lenin. these people don't make sense, nor do they have any interest in facts. that, and outright thievery, are how the right ruled for 8 disasterous years. deception and fear.